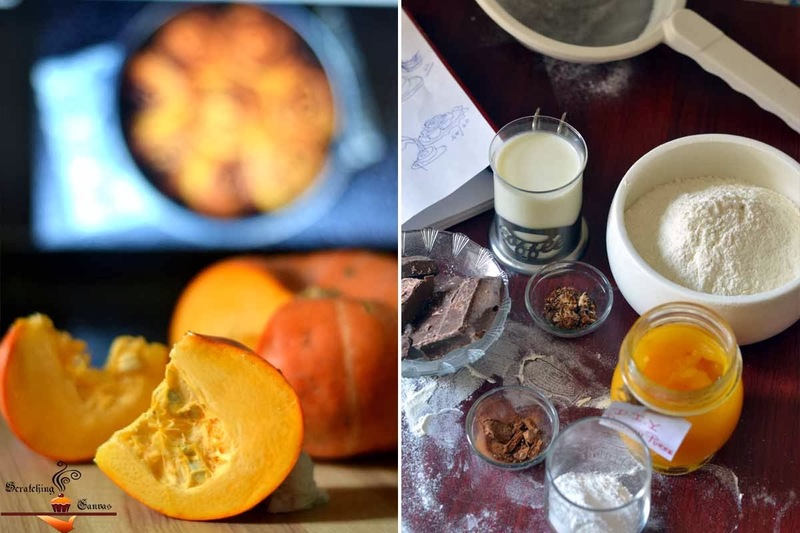 I just started my baking session with veggies and I’m in love with it already; ‘Truly Deeply Madly’. Though I’m still stuck with the pumpkin but honestly I’m loving every bit of it. I’ve already tried Pumpkin Ice-cream Bread with Chocolate Chips last week and few jars of Pumpkin Puree are still sitting in my refrigerator. 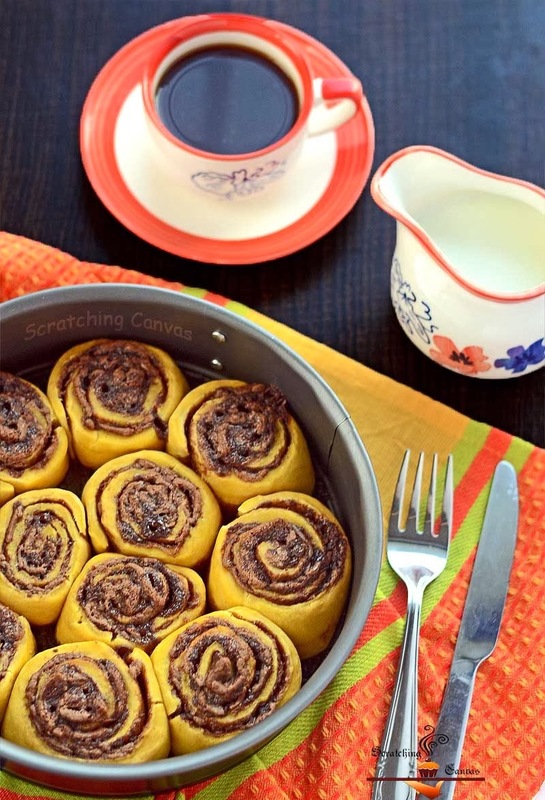 So here is my second trial with pumpkin; Pumpkin Cinnamon Chocolate Rolls. 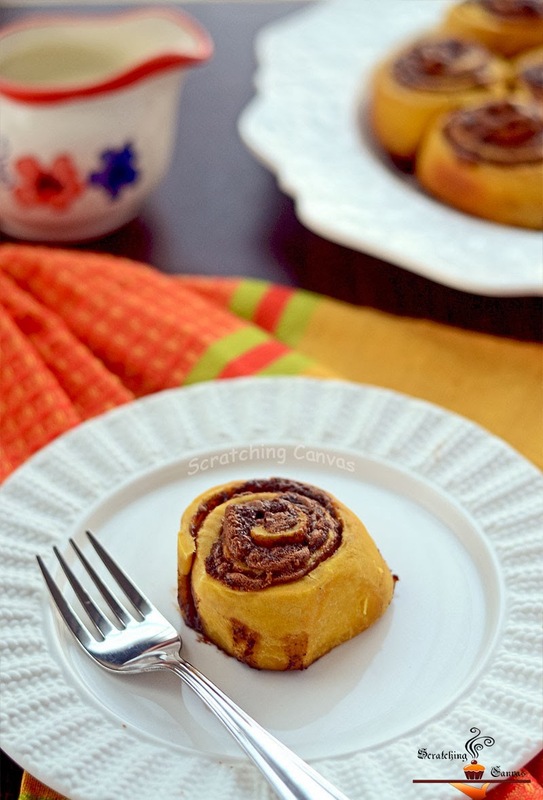 Who doesn’t love those fresh breakfast rolls with soft flakes of bread and full of fragrance of cinnamon. Even the thought of the cinnamon rolls make me drool. I always feel fresh when I see a basket full of cinnamon roll on my breakfast table just beside my strong black coffee. Recently I had this cinnamon chocolate roll in a coffee bar. Which was probably the best thing happened to me on that weekend. I adored them so much that I decided to bake some on my own. 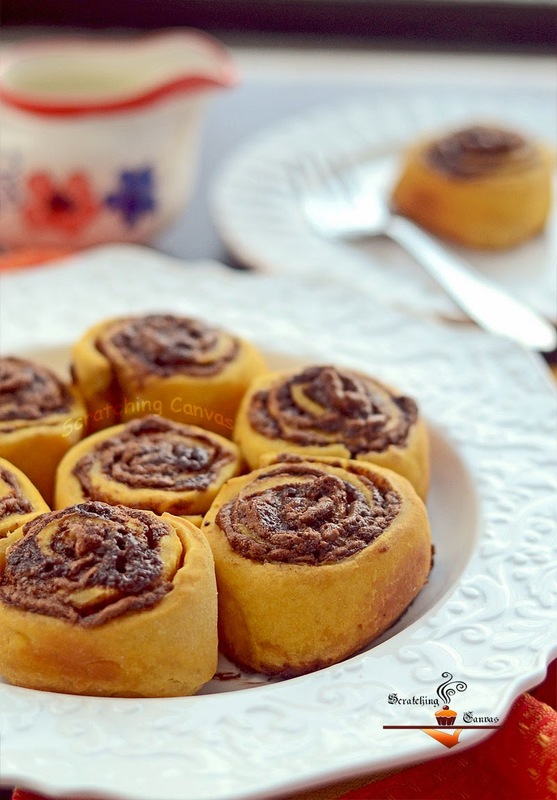 But as a matter of fact I was bit scared of baking my own cinnamon rolls as I never baked any kind of rolls/bread at home. 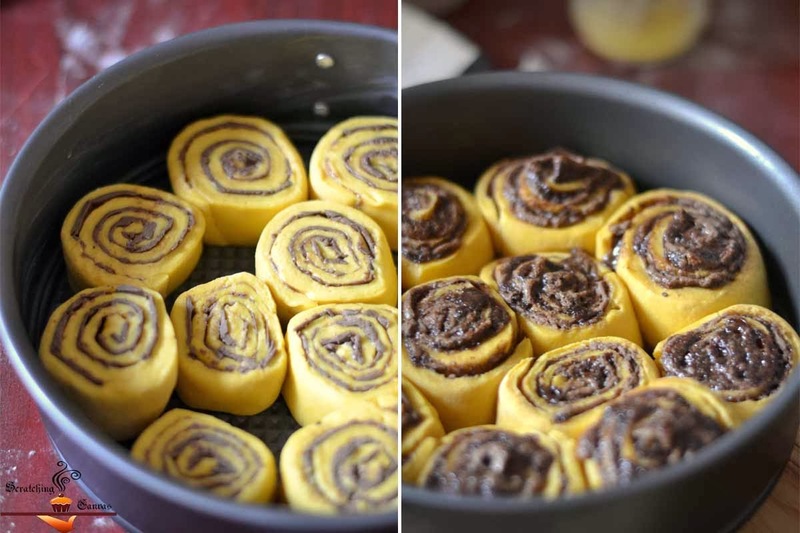 Since I have the jars of Pumpkin Puree which are nearly 7 days old now, I decided to make some Pumpkin Cinnamon Chocolate Rolls. As it was prompt decision I had no yeast at home so I proceeded without yeast and decided to keep it a secret mission. If it would fail it had to be gone straight in to the trash bin. I kept my fingers crossed throughout the baking time but couldn’t dare to go even near the oven. But when I remove the pan from the oven I couldn’t stop adoring myself. They are well risen (without yeast, remember? ), full of goodness of pumpkin, covered with molten chocolate, nicely colored and smells heavenly! 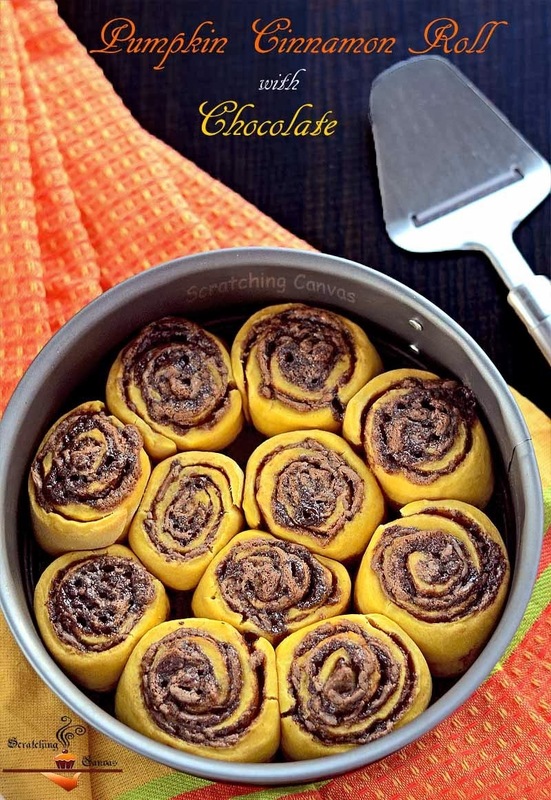 Here is my easiest and yummiest Pumpkin Cinnamon Chocolate Rolls recipe for you all. First, start from making the dough. 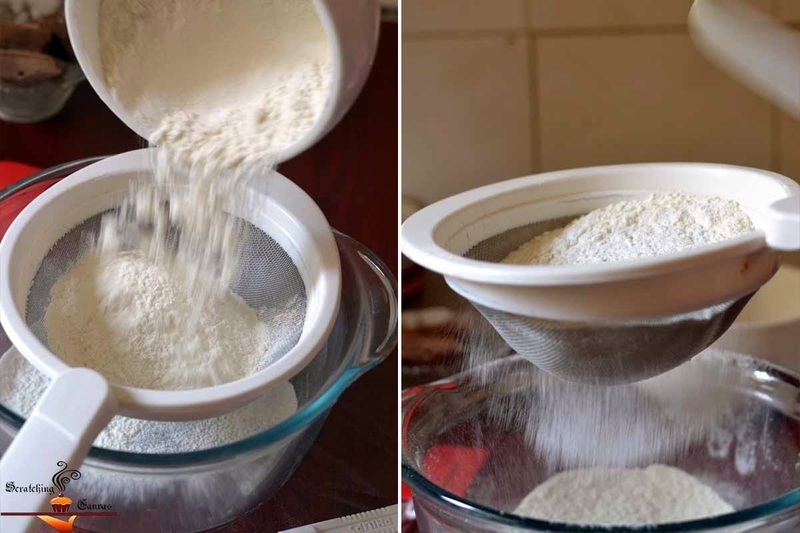 Sift and sieve the flour, baking powder and baking soda together in a large mixing bowl. Also sift the powdered sugar and mix with the flour. 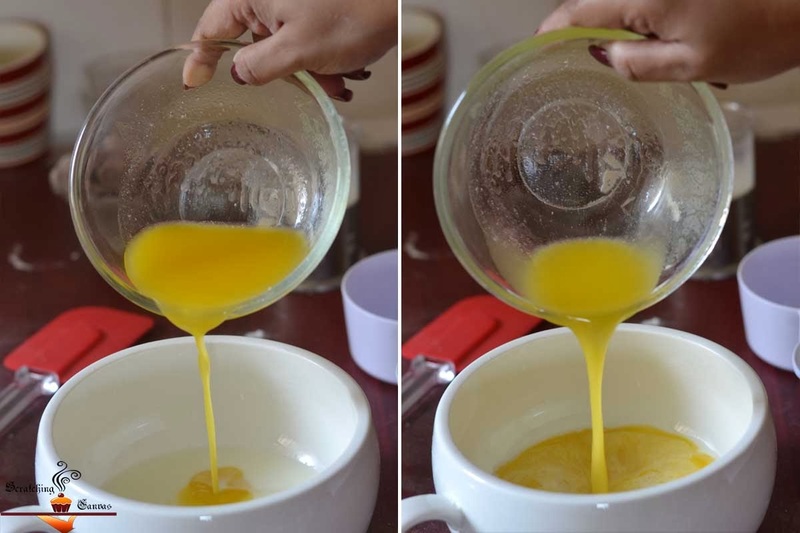 In another mixing bowl take milk and melted butter (specified for the dough) together and whisk lightly. Add the pumpkin puree and mix well with a spatula until blends together. This will look like very thick smooth puree. 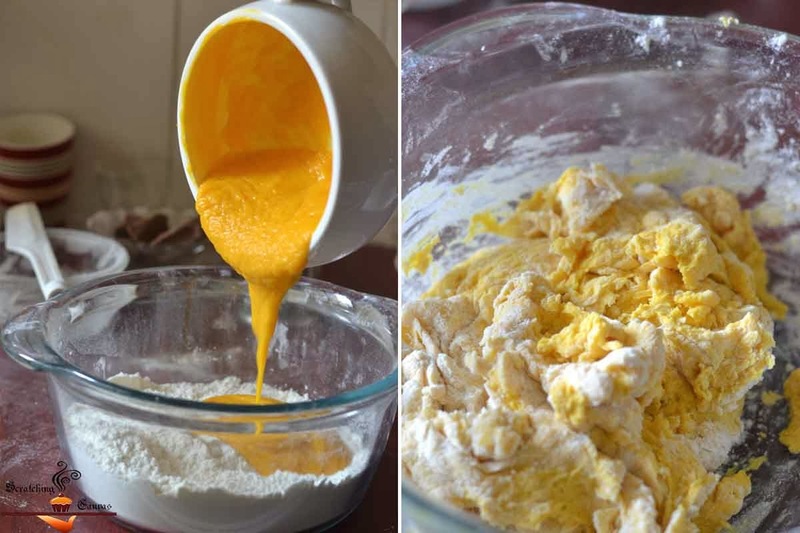 Add the pumpkin milk and butter mixture into the flour sugar mixture and start kneading with your hands. The batter will be sticky and thick at this point. Sprinkle some flour if your dough feels too sticky or add 1-2 tsp milk at a time if your dough looks all floury and dry crumbled. 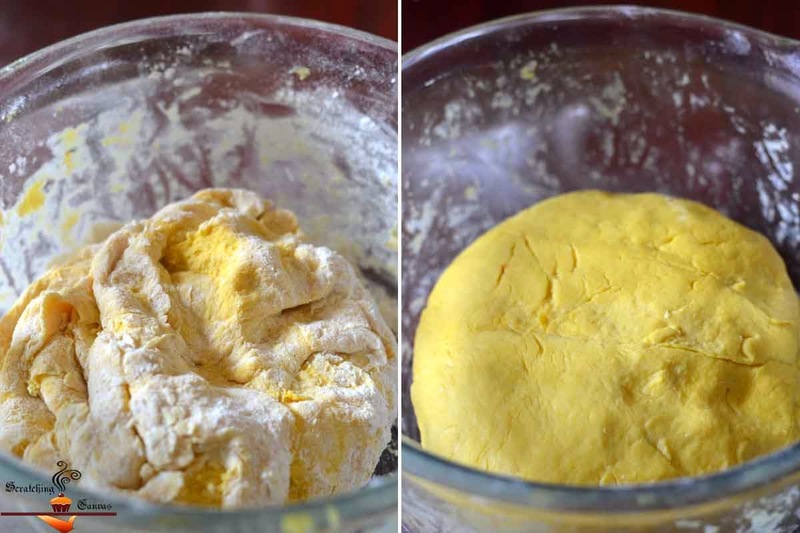 Knead with light pressure until dough becomes smooth and soft. Cover the dough with a damp cloth and allow to rest for 10-15 mins. 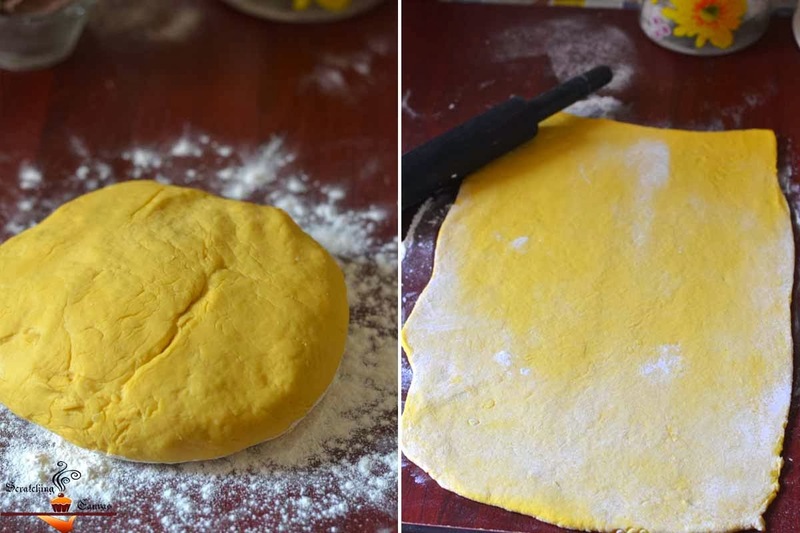 Roll the dough into a thin large rectangle. The thickness should be around ¼”- ½”; not more than that. Use more flour if needed. 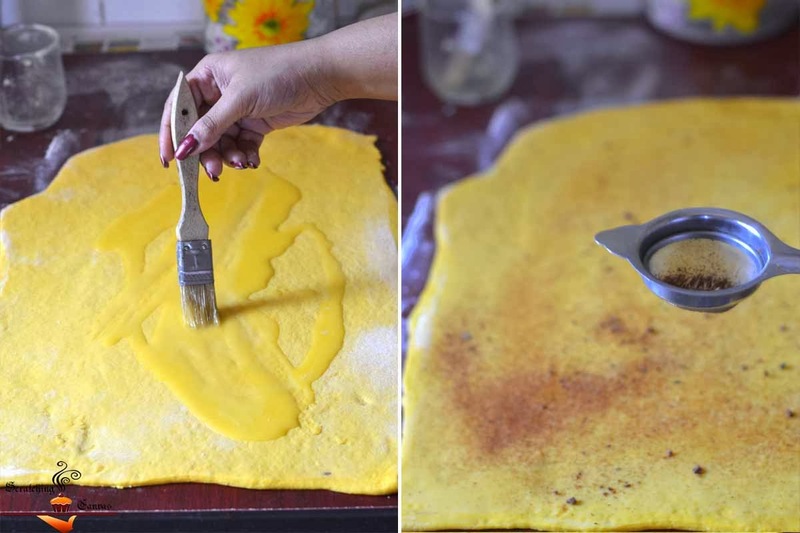 Apply the melted butter (specified for filling) on the top of the rectangle with a brush. Then sprinkle the cinnamon and nutmeg powder on top. Make sure you sprinkle the spices evenly. Now pour the melted chocolate on top as quickly as possible. Pinch the edges a bit to seal neatly. 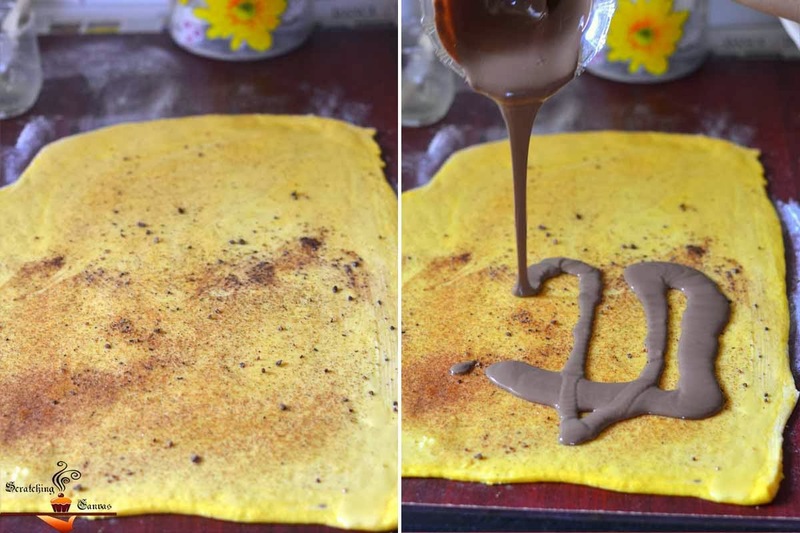 Preheat the oven to 2200C and prepare the spring form pan by greasing with butter. Once the rolls are nicely done, remove the pan from oven and place on a wire rack to cool down a bit. 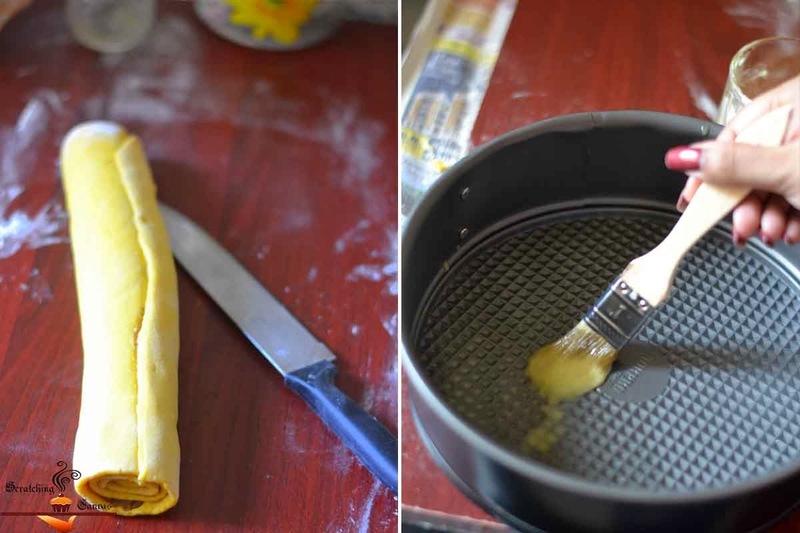 After 3-5 mins or when the pan is cool enough to handle, remove the side of the pan and carefully remove the rolls from it. Mix the ingredients for the glaze in another mixing bowl. 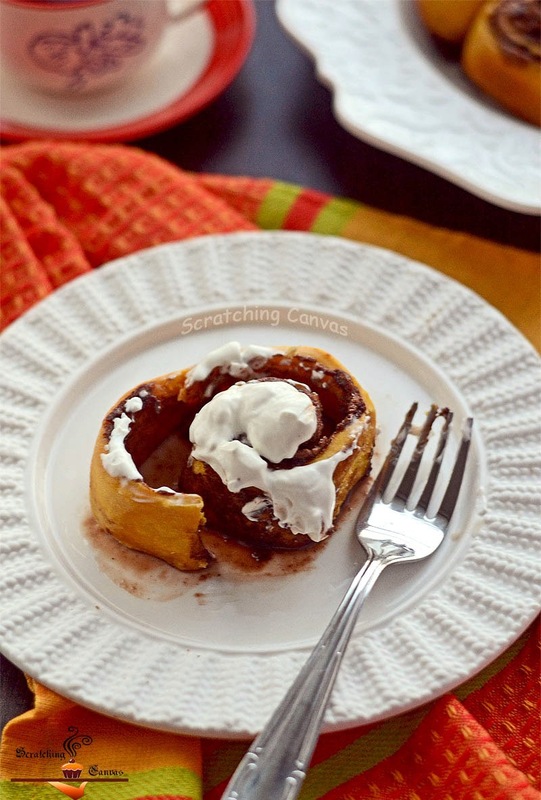 Transfer the Pumpkin ChocolateCinnamon Rolls on serving plates and pour the glaze on them. Serve warm. Smells & tastes best when served warm and fresh. To store for longer period, keep the excess roll in an air tight container and refrigerate up to 3-4 days. Warm for 1 min in microwave and serve with/without cream. 1. If you are using unsalted butter add ½ tsp salt in to the melted butter. Otherwise your dish will be way too sweet and unbalanced. 2. 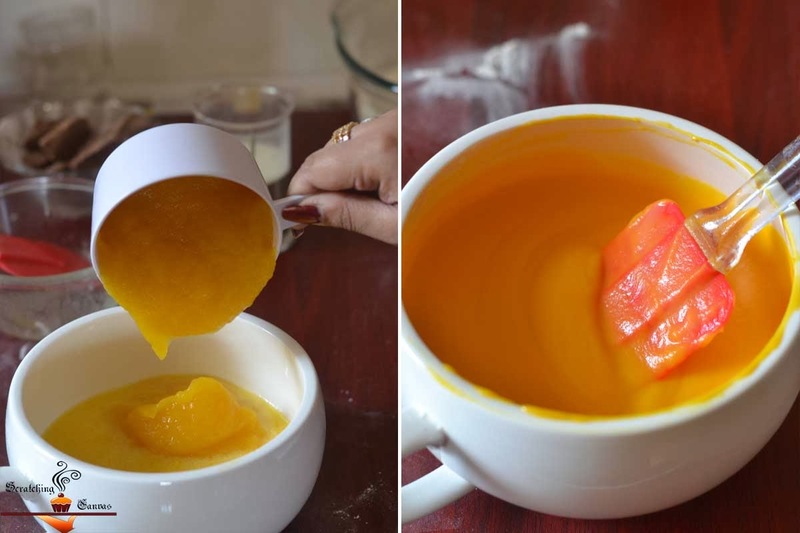 If you are using homemade Pumpkin Puree make sure you properly sieve and discard the excess water from the puree. 3. 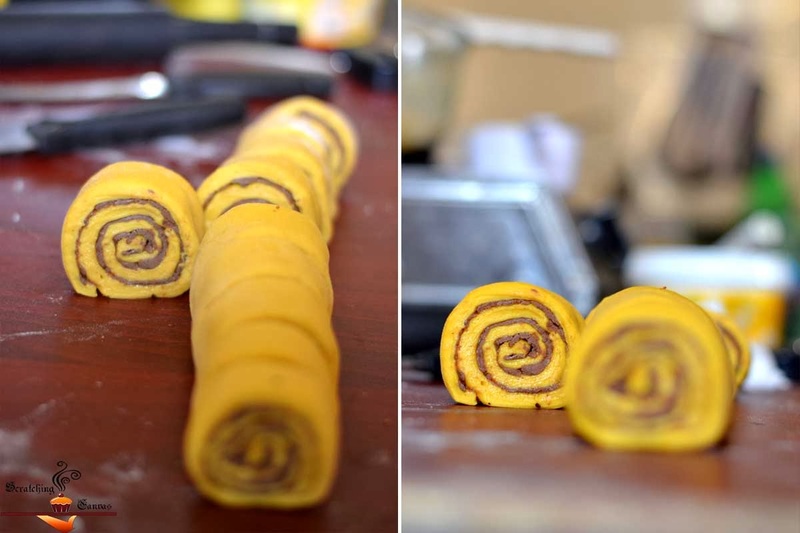 You will need a large board to roll the dough, it is better to use your kitchen counter for the purpose. Make sure the counter is clean and dry. 4. 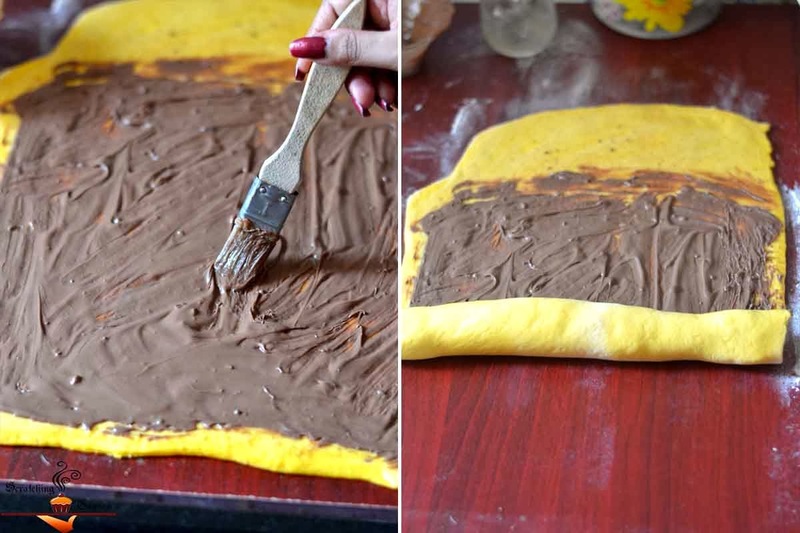 You have to be very fast after pouring molten chocolate on the dough and spread it across the dough quickly. Otherwise chocolate will be set. 5. To cut neat slices without disturbing the shape, move the sharp knife back and forth quickly. Don’t give any pressure on the dough. 6. Make sure you leave little gaps in between two rolls. This will allow the rolls to rise and be fluffy. 7. Keep checking the oven after initial time specified. It may take 5-10 mins more depending on your oven. Voila!! Enjoy the heavenly experience! 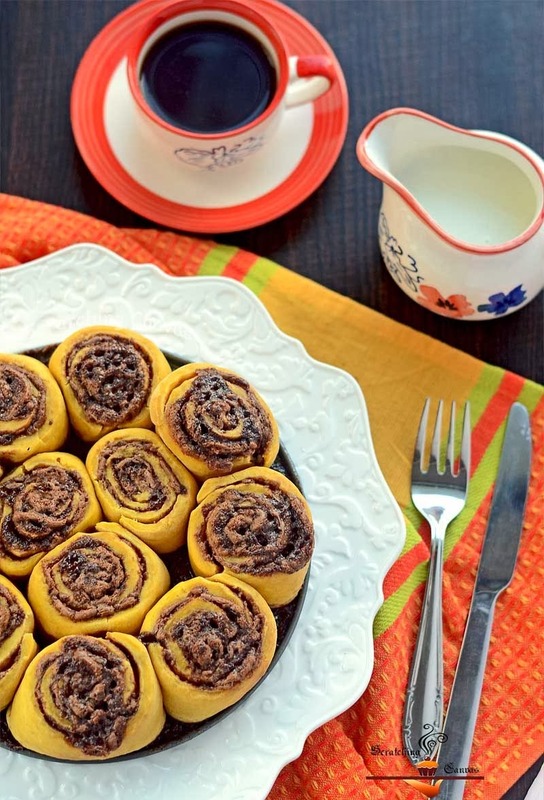 Flavorful and delicious pumpkin-chocolate rolls. Love the combo dear. wow fabulous looking cinnamon rolls 🙂 they look amazing ! !